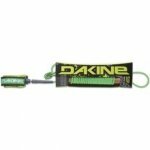 This lightweight SUP leash from Dakine is coiled to keep it out of the water while you are paddling and works great for mostly flat water use. At 10' long it won't pull too hard on your ankle, even if your board is long. 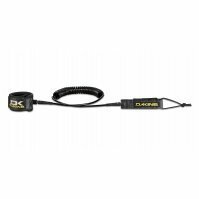 The 5/16" tubing is sturdy enough, but still light so you don't notice it while your are paddling. Attaches at your ankle with a comfortable neoprene cuff that has a quick release velcro closure.